Although Kernville is small, it’s also pretty hip, and there are several good gear stores where you can rent or purchase last minute items you’ll need for a Kern river trip. 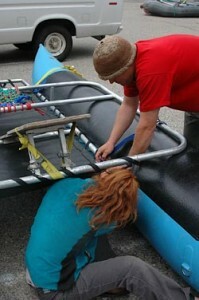 Both stores in Kernville have a great selection of kayaks and rafts. Mountain and River Adventure 1113 Kernville Rd, Kernville,Ca 93238 (760) 376-6553 New and Used river gear for sale and rental. Sierra South Full 11300 Kernville Rd, Kernville, Ca (760) 376-4875 Outdoor river store. Plenty of rafting and Kayaking gear to choose from. Online also. In the spring, when the Upper Kern runs at boatable levels, the weather is apt to change quickly. Don’t forget to bring your raingear and tent with a decent fly on it.